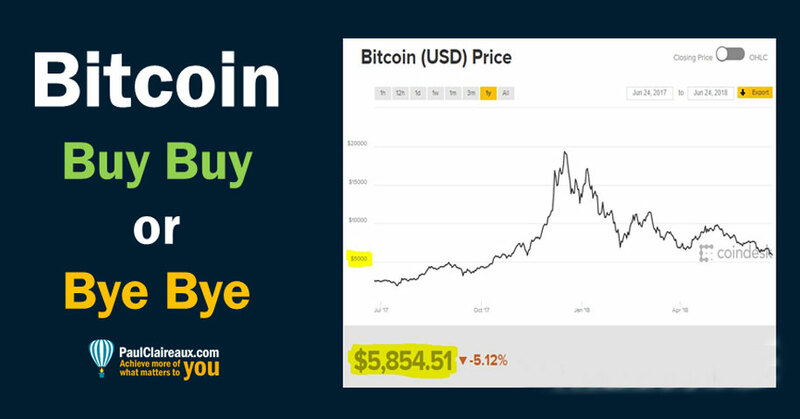 Home > Plan your Life > Should you invest in bitcoin? Please note the date of this article. Yes, it needs an update but the key points remain valid. In early December 2017, a friend of mine asked me if he should invest in bitcoin? So, I wrote this article for him at that time. And a few weeks later he was quite angry at me for this – because the price then doubled to close in on $20,000 . . .
Then, in just 6 days, it fell by half of it’s peak price. Now, the price is about 70% below it’s peak price. And just 50% of what it was in early December – or rather it is as I write this, my tenth update to this blog! So, my friend is calm with me now 😉 but as I told him, and cover below, I have no idea where the price will be next week – let alone later this year. And I’m really not fussed either. So, here’s what I told him . . .
Actually, before I get in to that, I just want to tell you that this question was a moment of deja vu for me. Eighteen years ago – in late 1999 another friend had asked me what I thought of the Aberdeen Technology fund. “The price was up 100% in just 6 months”, she told me as she thrust the promotional brochure (from a leading Investment Fund Supermarket) under my nose. She ignored my warning of course – and ploughed a good chunk of her life savings into the fund. The rest is history of course – and she regretted her decision enormously as she watched the value of her savings fall by c.90% over the next couple of years. And then by another 13% (of what was left) over the next 5 years after that. That was the ‘dot com bust’ playing out. And no, the price has not, 18 years later, got back to the price she paid for it. She didn’t talk much about that fund after that. Well, I guess by now we’ve all heard the story of Laszlo Hanyecz, the computer software guy who paid 10,000 bitcoin for two pizzas in 2010. Laszlo will have suffered more than the usual amount of ‘purchase regret‘ on that deal. Of course, feeling the fool after you’ve missed out is horrible but it’s the fear of missing out (FOMO) in the future that drives people into taking big risks in the first place. And the thing about FOMO driven behaviour is that it normally peaks at the point of highest risk. That’s why the tops of speculative bubbles are so ‘spiky’. So, let’s get one thing clear about the Bitcoin price. Any ‘asset’ (and I’m not sure that we can call Bitcoin an asset but that’s another debate) which goes up by a factor of 25 in 18 months is risky – super risky. And if you prefer percentages, a 25 fold increase is equivalent to 2,500% !!! Yes, two thousand, five hundred per cent. But let’s be quite clear . . . This is not like 1987 at all. Those were shares – shares in real, publicly listed companies – most of which produce profits and have a long term future. And the Stockmarket back in 1987 certain went mad for a while – but it only rushed up by about 100% in the 18 months before the crash. That’s very different to a rise of 2,500%. This is a price spike – the likes of which we’ve never seen before. More on that below. What we know is that rockets can and do fall to earth. They can easily fall by 90% in a short space of time – if the buyers who ‘pumped up’ the price get cold feet. 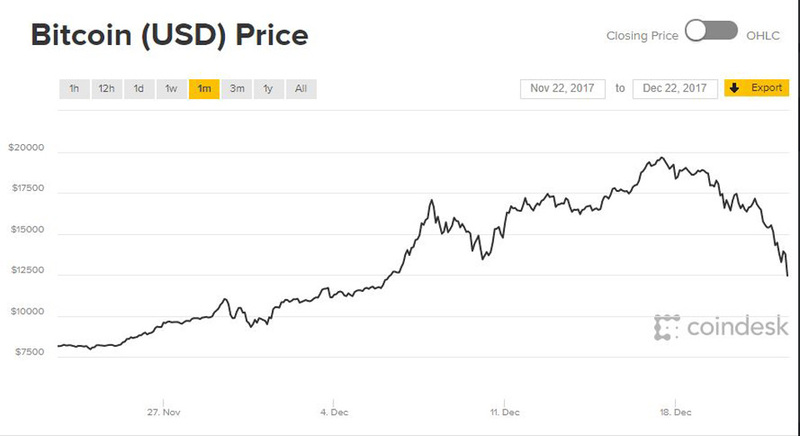 In just one week the bitcoin price fell by 40 percent from it’s all time high. The truth is that those ‘who dare’ sometimes lose. And quite often they lose everything they have – or even more !! So, it’s essential to understand RISK and more importantly your personal capacity to take it. Okay, but surely bitcoin is a currency? So, we’ll all be using it soon? Well, are you sure about that? One big test of a currency is whether it’s accepted by your government. In short, can you can pay your taxes with it? And the answer is NO, at least not in the UK for now. So, it’s not a currency for us at the moment and I don’t think it’s going to become one any time soon. What’s more, our (and other governments) are planning to crackdown on cryptocurrencies (of which bitcoin is just the biggest example of course) due to concerns that they’re being used for money laundering and tax evasion. Traders will be forced to disclose their identities. And platforms where bitcoins are traded will have to check their customers and report suspicious transactions. It seems that the ‘wild and wonderful’ years of this stuff are coming to an end. Ah, you might say, well then people will simply move their funds into other ‘unregulated’ cryptocurrency platforms. Yes, well if they did that, there’d be a massive sell off – of the current big cryptocurrencies, which would smash their price. And regardless of the new regulations coming in – which they will and soon – I can’t see how Bitcoin could be widely adopted as a currency. Just think about it. There’d be regular, huge changes to the bitcoin price of goods and services – due the price volatility of the bitcoin. Imagine the price of your grocery shop going down, yes that’s nice 🙂 . . .
. . . or UP, not so nice 🙁 by, say, 20% or more every week? Of course, once the whole world moved onto bitcoin as it’s currency 😉 and we were all paid in it too, this would be less of an issue – but it’s a big issue at the moment. And let’s think about this from the point of view of customers and suppliers of products and services. Realistically, how would they react to the facility to use Bitcoin to pay for services. Yes, I know that some suppliers are offering this facility today . . .
. . . but whilst Bitcoins are flying up in price – who, in their right mind, would use them to buy anything? No one would want to repeat Laszlo Hanyecz’s pizza order mistake, would they? So, it would make no sense to buy anything with your Bitcoin. And on the flip side – if and when the Bitcoin price starts falling heavily again . . .
. . . which product or service provider would want to accept such coins for payment? Some degree of price stability is required for any currency to work. And then there’s China, the world’s second largest (and likely, soon the world’s largest) economy – who clearly want to put an end to this bitcoin game. So the dream world where we all use bitcoin would appear to be some way off. Okay, I get that and hopefully, pressure will come to bear on the banks and payment providers to bring down costs. Indeed, on PayPal for example, you can already create an account for micro-payments where the fee structure works better. Do you really understand this well enough to start encouraging your customers to get some Bitcoin – just to pay your bills? And if you think transactions costs are low – I’m afraid that you’re out of date already. Alright but I just want to make a quick profit? Well to achieve that you first need to be sure that you’re trading in a liquid market. Unfortunately, that might not be possible with Bitcoin. As long ago as December last year (According to the Sunday Times 10 December 2017) Brian Armstrong, the chief executive of Coinbase (the world’s biggest bitcoin exchanges) has warned that its systems may collapse if there is a run on the digital currency. This could leave investors unable to cash out their holdings. In other words, if the price of Bitcoin goes into free-fall – and you want to get out – you may not be able to !! Now, if that doesn’t worry you enough – there’s this. To have a reasonable chance of making a fat profit – you need to know that the price at which you buy Bitcoin is ‘fair’ and that it’s skyrocketing journey will continue a while. But what’s a fair price for this thing ? William Goetzmann, a Yale economist is quoted in the Financial Times (Dec 1st 2017) as saying. Of course you could say that the fair price is the market price. That, after all, is what people are prepared to pay for it . . . today! But that doesn’t work too well in situations like this. Remember the dotcom boom of the late 1990s – that caught out my other friend in that ‘technology’ fund ? That’s just one example of the many times when ‘Mr Perfect Market’ got it wrong, big time, on prices. On that occasion, investors were buying anything with ‘internet’ or ‘dot com’ on the label. There were thousands of internet company start-ups. Most of them were loss makers with no prospect of earning a profit. But somehow, ‘Mr Market’ valued them at millions . . .
. . . and then, between 2000 and 2003 he valued most of them at nothing. And let’s remember that a few major companies got caught up in that ‘technology’ mania too. You see, it’s only after a bubble has burst that people see the absurdity of it. Of course, the internet did change our world – and a few companies (like Amazon and Google) have done very well out of it. But billions were poured into and lost on the vast majority of the others. So, if you want to bet your farm on bitcoin, that’s up to you. But the odds of that cryptocurrency (or any other) being the single BIG winner don’t look good to me. Another investing approach is this whole ‘blockchain’ technological revolution is to back the serious companies that will benefit from using it. Perhaps IBM’s big comeback time is here – who knows? It just feels like dot com mania all over again from where I’m sitting. What really worries me is the speed of the bitcoin price move. 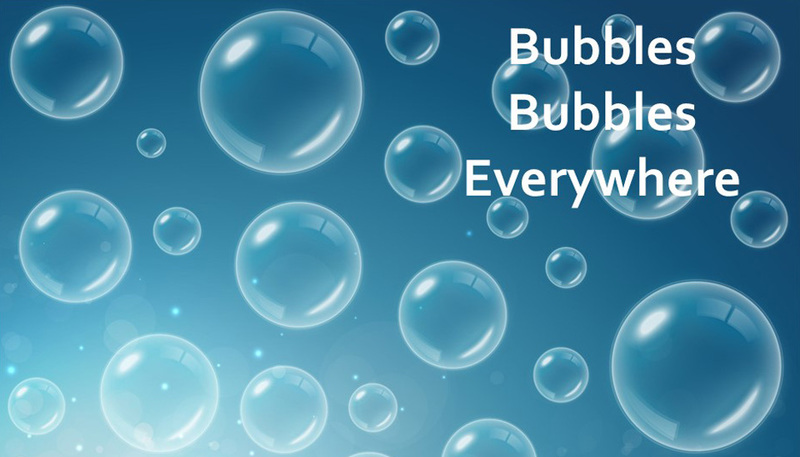 It made all other bubbles, in house prices and stock-markets – including the dot com boom – look like a stroll in the park. And in case, like me, you don’t see it immediately . . . the bitcoin price is the vertical orange line on the far left hand side! 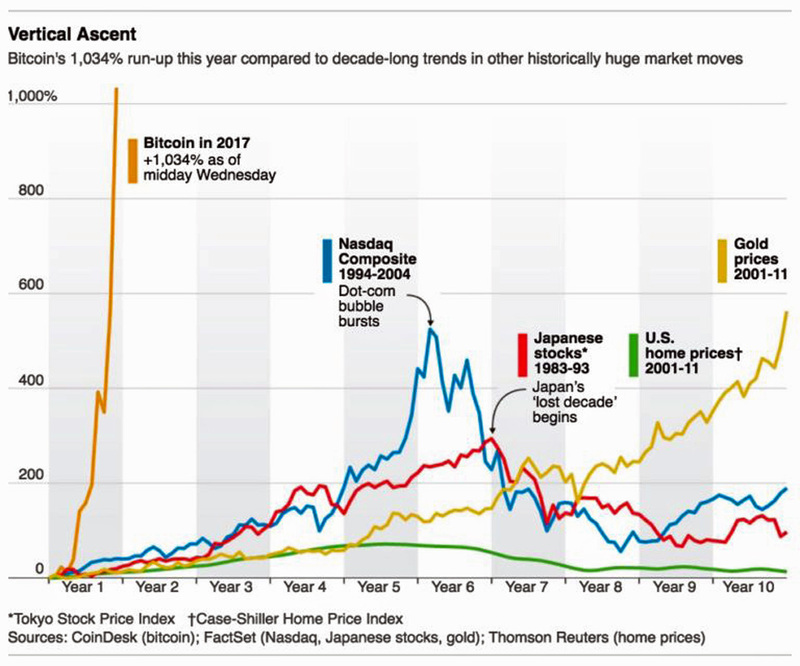 You may not know it – but something big happened in the markets late last year that may well have seriously upset the Bitcoin price. Bitcoin futures are now being traded for the first time on the Chicago Options exchanges. So, as Gillian Tett pointed out (in the FT 16 November 17) investors are now able to bet on the coin’s future value without actually holding it – just as they do on hog prices – without ever handling a pig. Some of the big brokers at the CME gave warning last year that they were very concerned about how this would work with Bitcoin. They were worried about the CME’s capacity to absorb any losses given the extreme price moves in bitcoin. And this is because the price of a futures contract seriously magnifies the price of the underlying security – which is already making absurdly big moves. One argument is that bringing bitcoin into the mainstream investment world should boost its appeal and demand – and push it’s price up even further. However, as Gilliant Tett argued it could have precisely the opposite effect. And without question, if some big speculating investors decided to play bitcoin – then the price would move a long way and very fast indeed. Imagine that some speculators decided to position themselves (going short on the new futures contracts) for a big collapse in the Bitcoin price. Until now they’ve been unable to do it – the only way to “short” Bitcoin is to sell coins that you own. But what if the speculators were in the party buying bitcoin too. To deliberately ‘ramp up’ the price? Someone’s been ramping it up – the price didn’t rise 13 fold in a year without some heavyweight buying going on. Any speculators who went ‘short’ on Bitcoin after the peak – have made a fortune very quickly as the price has come down. And thousands of small and late buyers into bitcoin have been financially killed – just as they are when this happens in other assets. I may be wrong – very wrong – but looking at what’s happened in recent weeks – this ‘ramping’ could well have been what was going on. And to be clear – i gave warning of this back in early December last year. And most importantly – nor does anyone else. The third of these is absolutely critical to get right on each of your savings or investment goals. 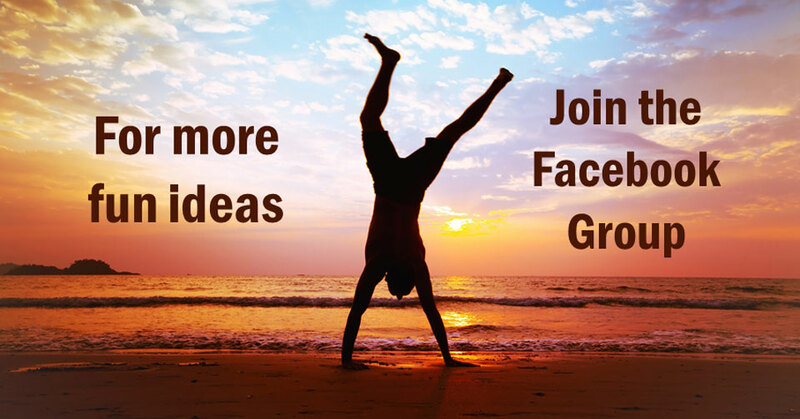 And yes, they can be different – so stick with me on this site – if you want to learn more about that. Most people forget all of this stuff – during speculative manias. They’re just blinded by the promise of quick riches. So, they get drawn in to buy the asset (or whatever it is) along with a lot of others – at the top of the price cycle. And then get badly hurt as the price collapses. I’m afraid that this is how this game goes – time and time again. His book offers entertaining insights into a range of absurd human activities that involve herding or group copying behaviours. His examples include financial bubbles, alchemy, the crusades, witch-hunting, fortune telling and even the influence of politics and religion on hair (and beard) styles! 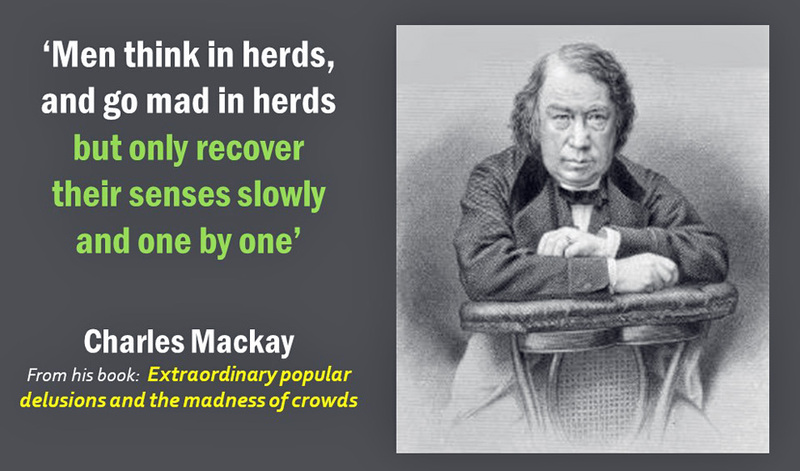 MacKay was a journalist and some academics criticise his sensationalist style, but many also recognise the difficulty of finding reliable data from 400 years ago. One thing we can say is that MacKay’s book helps us understand more about social psychology. According to his report – at the peak of the tulip mania, in 1637 . . .
. . . 12 acres of land were offered for a single Semper Augustus Tulip bulb. It seems incredible now – that such prices were ever reached. And whilst MacKay might have exaggerated things, most historians agree that tulip bulb prices went through the roof at this time, and price speculation using futures contracts was rife. 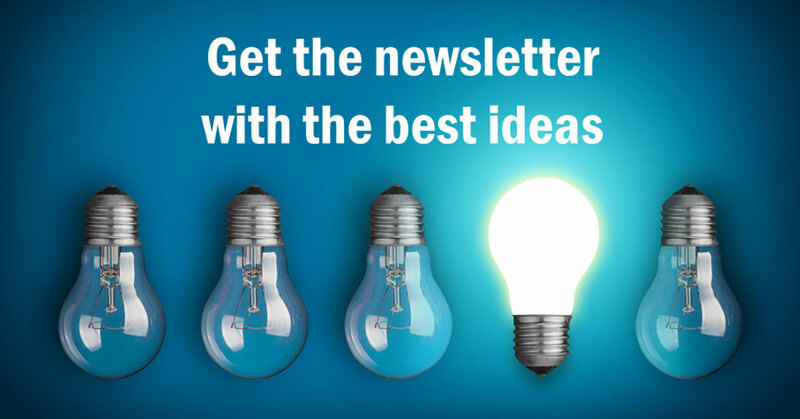 The story goes that when the bubble burst and prices collapsed, some people were left holding contracts to buy bulbs at ten times their new market value! So, a great many people were financially ruined by the experience. That’s something to remember as the market for Bitcoin futures opens in Chicago this month. As is the fact that what goes up like a rocket – can fall to earth like one too. 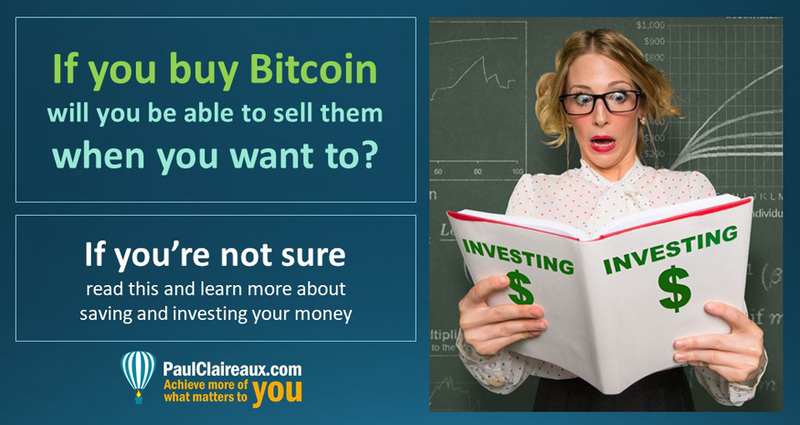 So, should you”invest” in Bitcoin? Well, that’s really your call. But whatever you do, remember the third of those 3 points above.
. . . on each of your financial life goals. And if you need help doing that – give me a shout. It’s just one of the things I help people with.